Association de la Famille Daigle was originally cre ated for the purpose of organizing the 1999 Louisiana Reunion and furthering interest in Daigle/Daigre genealogy. The 1999 and 2004 reunions are behind us now, but we plan to keep growing toward the next Reunion of 2009 in New Brunswick. 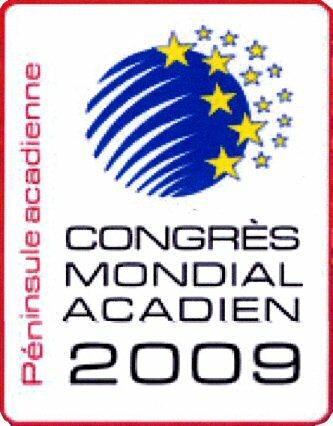 Click on the logo below to go to the CAFA Home Page (Confederation of Associations of Families Acadian) or CMA 2009 (Congres Mondial Acadien) for more info and other family links. Thanks to a profitable reunion, the Association de la Famille Daigle has made a $500 donation to the French Immersion Program at Paul Breaux Middle School in Lafayette, LA. Jeanne Solis-Daigle chaired this event and made the presentations. Her daughter, Erin, is a student in the program. Click here for photos. The association also made $300 donations to the French Immersion programs of Pierre Part Primary , Pierre Part Middle and Assumption High in 2004 & 2005. Click here for photos of these presentations. (Th e Inscription on the crest to the right reads: "SicutQuercus",which means "As the Oak" and is the crest of the descendants of Jean Daigle. The crest to the left is the Acadian Crest of the descendants of Olivier Daigre). If you know any person, past or present, with the Daigle name that has made contributions of this caliber, please send a short biographical sketch to Lloyd Daigle. We will add them to the current list and run a short article on them in the newsletter. Our latest edition of Eagle's Wings, the quarterly publication of Association de la Famille Daigle, contains several items of interest. Articles included are: History of the Congres Mondial Acadien, Attempted Deportation of Daigles to Virginia, Update on 2004 Reunion, and an update on the DNA analysis project. To receive this issue of Eagle's Wings and the year's back issues, become a member by completing and mailing in the membership form.Dues are only $10.00 per household. Keep up with the news on upcoming reunions. Click here to see how you may assist us. Check out the NEW PICTURES of the Olivier Daigre land in Nova Scotia!